One of the things we look forward to every fall in the DC/Baltimore area is a slew of Greek movies coming to theatres as a part of two annual events. The Contemporary Greek Film Screening Series in Baltimore is showing two remaining films in November and December at the Baltimore Museum of Art and the European Union Film Festival at the AFI Silver Theatre in Silver Spring is showing one Greek film in its two week run. 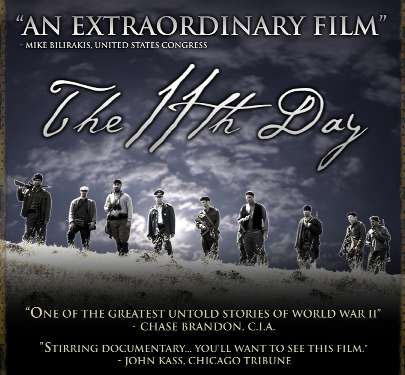 The 11th Day, showing in Baltimore on Sunday November 5th twice, in both Greek and English, is a documentary on the Battle of Crete during World War II. Great production values, a stirring soundtrack, and some seemingly accurate reenactments highlight this movie made by a pair of Greek-American brothers of Cretan descent. Last year’s showing at American University saw a packed house of awe-struck Greek-Americans and others. For those in the area who haven’t seen in this film, the trip to Baltimore on Sunday is definitely worth it. On December 3rd, the Baltimore Film Festival ends with Rizoto, a stylishly tongue-in-cheek look at the gender gap, highlighting the realities of juggling career, family, and romance. Set in urban Greece, the film follows the lives of two families: fashion photographer Eugenia, husband/editor Filippos, and their daughter Sophie; and stylist Vicky, lawyer/husband Manolis and their two month old son. This seems like much lighter fare than most of the movies from Greece brought to the DC area of late. The most intriguing film based on the synopsis is The Wake (Agrypnia) showing on November 17th and 18th at the AFI Silver in downtown Silver Spring, MD. Andreas is a cop on the run. His life has reached a dead end; he has just shot his wife and is trying to flee the country. Nikos, a priest, is Andrew’s estranged younger brother. They have not spoken for a decade. Andrew needs someone to help him get away. Nikos is his last resort. Together they spend an eventful night, during which Andreas musters all his underground contacts to organize his escape. This night is The Wake for their past and for Andreas’ wife. Edgy.